This is another Klamath figure secured by Mr. John L. Cox, from Emma Jackson, of Oregon. First: The same as the First movement of the "Two Little Boys Running Away." 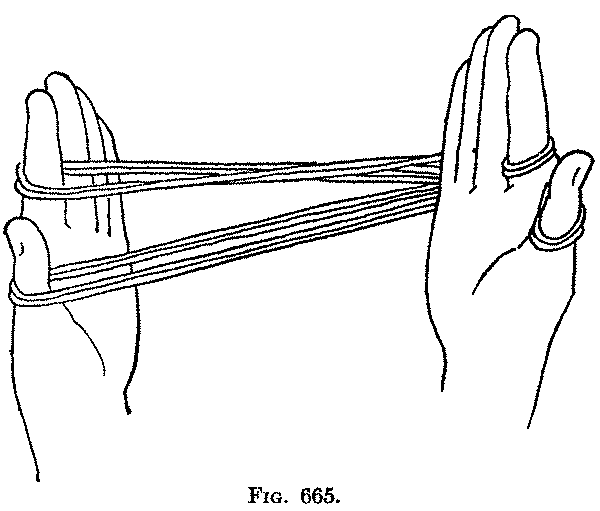 Second: Holding the figers of the right hand close together, turn the right hand so that the finger tips sweep down toward you under the figure (Fig. 664), and the whole hand comes on the near side of the figure, the finger tips pointing upward and the palm facing toward you (Fig. 665). Third: Pass all four fingers of the right hand up on the near side of the left thumb loop and put them from below into the left index loop, so that the left near index string becomes a palmar string on the right hand (Fig. 666); remove the left index. With the left thumb and index take hold of the palmar string of the loop which is on the right index (above the right palmar string) (Fig. 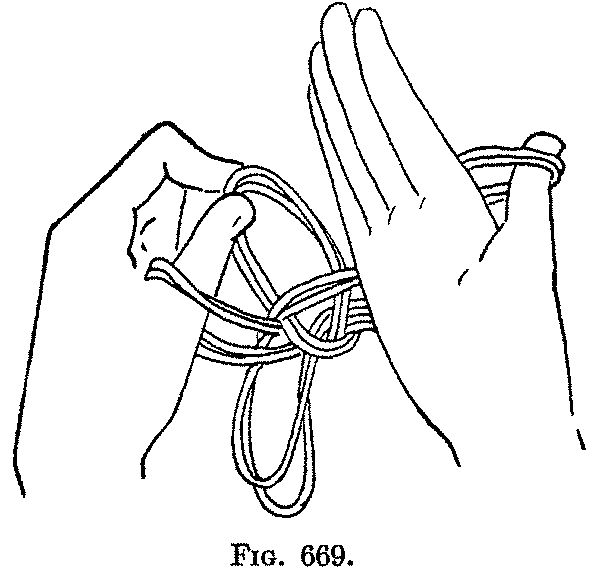 667), and, keeping the loop on the right thumb, withdraw the right hand from all the other loops (Fig. 668). Turn the right hand again so that the finger tips sweep toward you under the figure and point upward, the palm facing toward you (Fig. 669). 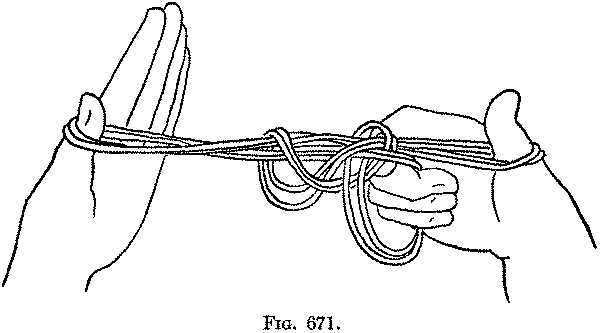 Fourth: Pass all four fingers of the right hand from the near side (that is from below) into the loop you have been holding between the tips of the left thumb and index (Fig. 670). 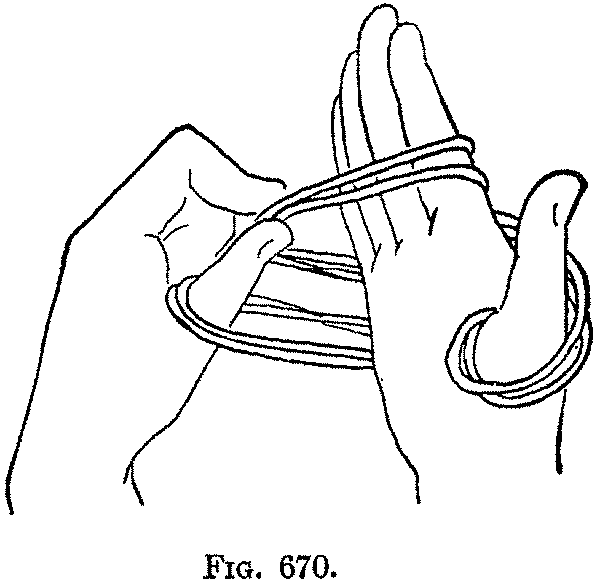 Release the loop held by the left thumb and index and close the fingers of the right hand on the palm (Fig. 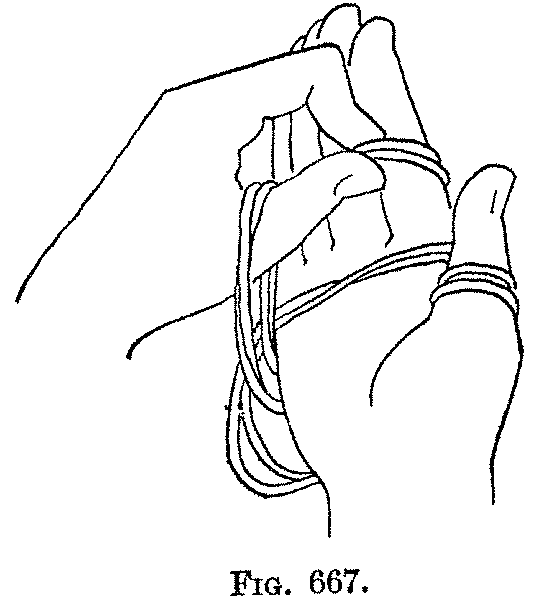 671); put the left index, ring and middle fingers (below the other strings of the figure) toward you into this loop beside the fingers of the right hand (Fig. 672). 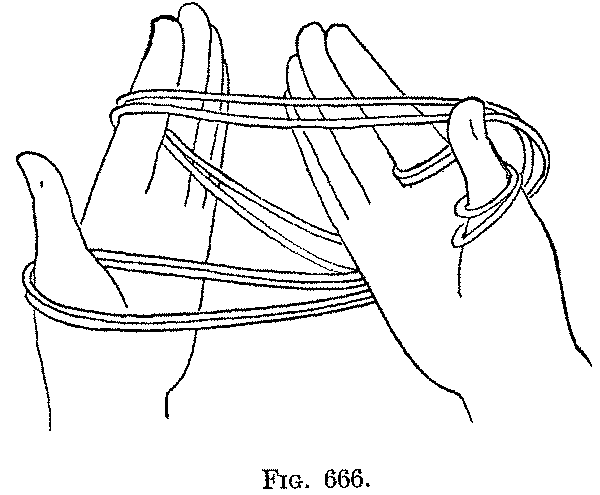 Fifth: Remove the right fingers from this lower loop, and hold the loop by bending the fingers of the left hand down on the palm; then sweep the right hand with the palm away from you, or in such manner that the strings of the right thumb loop become untwisted and parallel, and pull to the right on the right thumb loop until the twist in the figure is tight, but not formed into a hard knot (Fig. 673). 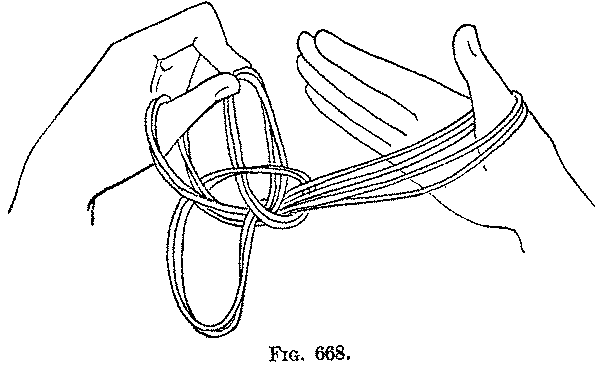 Sixth: Withdraw all four fingers of the left hand from the loop (Fig. 674). 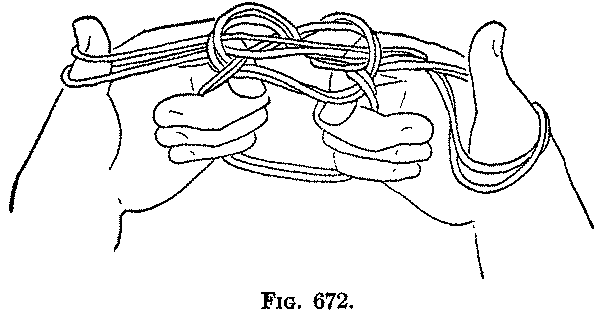 The knot and hanging loop represent the "little Fish"; by pulling on the two left lower strings the knot comes apart and the "fish escapes into the mud"; by pulling on the two right lower strings the knot is drawn tighter and the "fish is caught." This is not a difficult figure, although the description would lead one to think so. The majority of the movements are new and I have not observed them in any other figure.